KYIV. Aug 20 (Interfax) – Ukrainian Prime Minister Arseniy Yatsenyuk said the damage done to Ukraine by the war in southeastern Ukraine is in the billions of dollars. “It is very difficult to have a working economy and a healthy financial sector in a situation when there is a war going on in the country,” Yatsenyuk said while opening a government meeting in Kyiv on Wednesday. “We lose our economic potential every day,” Yatsenyuk said, adding that Ukraine’s economic development is directly dependent on the developments in the southeastern regions of the country. “According to our information, the terrorists, whose fire is regulated from Russia, are attacking the most important Ukrainian infrastructure facilities such as mines, electric power stations, electrical power grids, railways, bridges, supply lines and infrastructure. 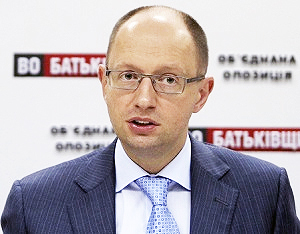 The damage done to Ukraine every minute is in the millions,” Yatsenyuk said. Yatsenyuk reiterated that Ukraine continues its cooperation with the International Monetary Fund and the World Bank despite this situation.